In the past few years, portable digital devices have triggered a trend toward the “quantified self.” Many people now measure the steps they take, the calories they eat, how many times they shift in their sleep, and other daily minutiae to capture a picture of their health and their lives. But some people have taken to using data to provide a much more unusual and emotional picture. The data artists and designers below use similar techniques to record things that most people’s FitBit records do not show -- like all the reasons one woman cried over the course of 18 months, or one man’s emotional state during a marriage proposal. There might seem to be some sort of basic contradiction between the cold, calculated nature of data and charts, and something so alive and emotional as having a cry-fest or popping the question. But these projects provide a unique record of fleeting emotional experiences that deserve to be recorded at least as much as footsteps. Here are five data projects that quantify the self as you probably haven’t seen before. The graph below was posted on Reddit by a self-described “generic 28-year-old male,” who wore a heart-rate belt during a trip to Rome where he proposed to his now-wife. He exported the heart monitor data and created the graph in Excel. The left-hand axis shows his heartbeats per minute, while the bottom axis tracks a 40-minute period that included walking in the Coliseum, eating ice cream, the proposal -- and finally chilling out on a bench. Designer and developer Robin Weis started tracking her crying to better understand her emotions during a particularly turbulent period of her life, after someone close to her attempted suicide. She tracked her tears over 18 months, sorting all of the crying episodes she experienced to create the graph below. The reasons she cried are separated into eight general categories on the left and 28 situational contexts in the middle. On the right, those crying incidents are matched up with 44 unique emotions she felt while crying. As the graph shows, the majority of her tears were caused by breakups and romantic relationships -- partly due to some difficulties and then a break-up she experienced in a long-distance relationship. She classed about one-fifth of the crying episodes as “life-related cries” due to decision-making, traveling, or just having a bad day. Family was the source of 13 percent of her crying episodes, and linked to the most diverse array of emotions. About 8.5 percent were due to reflection, like evaluating past decisions and actions. On Saturday, he catches a few hours of sleep between midnight and 4 a.m. (the portions of the graph where you don't see vertical bars) but on Sunday he is not so lucky. Except for two blissful hours between 4 a.m. and 6 a.m., he is almost constantly in motion. 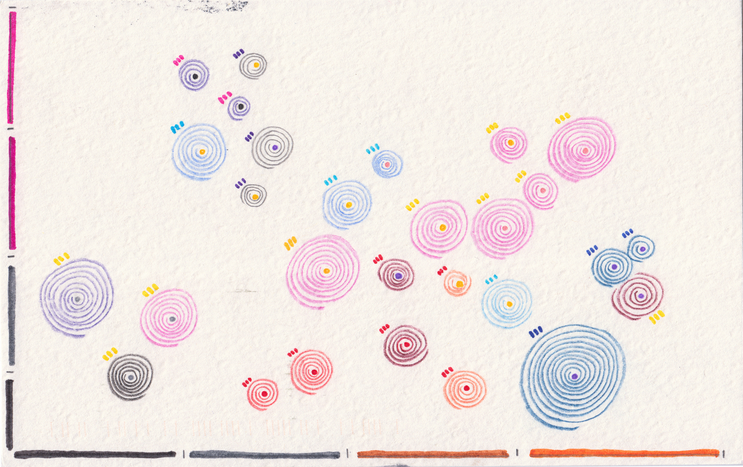 Last year, artist/designers Giorgia Lupi and Stefanie Posavec carried out an award-winning project called Dear Data , in which they sent each other postcards each week for a year measuring and charting an aspect of their lives. They graphed their laughter, the swear words they used, their desires, and their to-do lists. For one week, they charted every time they experienced envy. In Lupi’s chart below, the colors indicate every time she felt envious and why, while the size of the swirl indicates the intensity of envy she felt. One of the most famous data projects that quantified life in an unusual way is by Nicholas Feltron, a designer who for years compiled the events of his life into a glossy annual report , the kind that corporations put out each year. The report summarized his drinking, his computing, the music he listed to, all the words he used in the English dictionary, and other data points. In the chart below, from his 2011 annual report, he maps the places he went in New York City with his significant other, Olga.